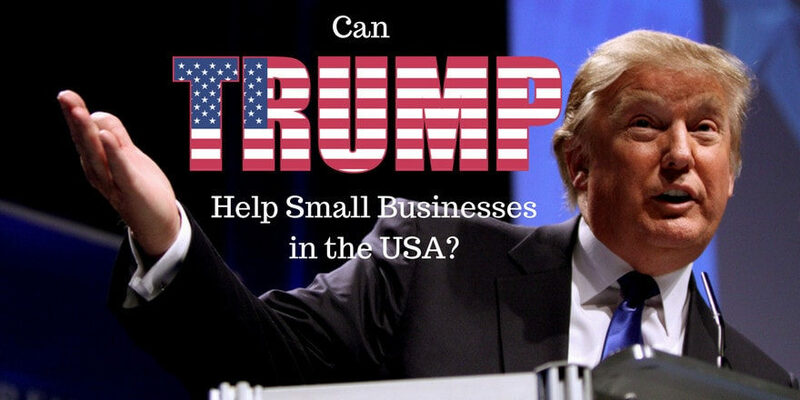 Can Trump Help Small Businesses in the USA? After the citizens of the United States voted Donald Trump in as their new President, people have had mixed reactions. Can Trump help small businesses? Individuals and business owners have varying opinions on how events will turn out with Trump at the helm. As Trump comes to the end of his first 100 days in office, there is no doubt that many businesses will still be harboring concerns about the President. Donald Trump has caused a lot of controversy, and he often dominates the daily MSNBC breaking news stories. It is unclear how his presidency will affect the economy and the world of business as a whole. How Could the Trump Administration Help? Here are some steps President Trump could take to help smaller companies. Some believe Trump needs to create tax requirements and incentives to encourage larger corporations and government agencies to hire small businesses. According to these experts, doing so would create greater value and boost employment. Others have expressed concern about how difficult communication with government agencies can be. Such communication breakdowns create problems for small businesses with limited resources. Streamlining and improving the lines of communication with larger companies could also benefit small businesses. One possible solution is creating a central access point for small businesses to use in order to access government resources. When it comes to taxes, Trump has already been at the center of controversy. However, officials believe that he could do his part by cutting taxes for small businesses. Doing so would also mean lowering individual taxes. The reason why is that the government taxes most small business owners on their individual returns, whereas it does not do so to large corporations. So Trump needs to look at a reducing individual taxes in order to maintain fairness among businesses. See below for more information on this topic. One expert has said that the Trump administration needs to focus more on prioritizing the needs of small businesses. He said that a comprehensive small business agenda has not been developed for many years. As a result, this issue is an opportunity on which the new government could capitalize. Many small businesses are concerned about health care after Trump said that he would be making changes. Business experts believe that Trump needs to provide swift clarification about his plans. In particular, he needs to ensure that health care is affordable for small business owners. Will Trump Help Small Businesses? Here are some additional resources for those who would like to explore in more depth how President Trump’s decisions will impact small businesses. Obamacare vs. Trumpcare: What’s the Best Solution for Small Businesses? This post explores potential advantages and disadvantages of replacing the Affordable Care Act with the American Health Care Act. There are different ramifications to small businesses cost-wise depending on whether the U.S. runs on a single-payer system or a public option. Only a few days ago, the Trump administration announced tax reforms that promise to be of significant benefit to small business. The reforms would involve cutting the tax rate for small businesses by over half, and they could go into effect in the latter half of 2017. April 30-May 6 is National Small Business Week. In commemoration of small business, the Small Business Administration (SBA) will carry out various events and honor the Small Businessperson of the Year. The SBA provides support to small businesses, including free information on starting and running a company. The agency also provides info on acquiring loans and qualifying for government contracts. Will the Optimism Be Justified? Small businesses are a vital part of the economy in the United States, so the Trump administration ought to prioritize them. As recently as the end of last February, 47% of small business owners approved of Trump. However, what the administration actually will do in the end for small businesses remains to be seen. Husband,Success Coach, Business Development Consultant, Strategist,Blogger, Traveller, Motivational Writer & Speaker. I have the propensity for written expression, piling one word on top of another until a coherent thought emerges. My favorite subjects are business, politics, religion, technology, lifestyle and history.Also write about his personal experience on financentric and writes a weekly article on hulkusc. Follow me on Twitter. I think the answer from an economics point of view is no. However, he definitely seems to be helping major corporations that are already making billions. Thanks for sharing this article, I’m not too much of a trump fan but this is really interesting to read!! The country which ignores the small businesses of its country, continues to face a lot of economical problem which is not right for the country’s economy. So, Trump should must help small business to grow in the USA,. These all steps sounds pretty good like encouraging the hiring of small business, lowering taxes for small businesses, also prioritizing the needs of small businesses. The trump administration should must help small business in the USA. I do agree with your opinions to help small business. Thanks for sharing with us this article. You raised several excellent points M.
perspective, on a subject which definitely needs to be discussed. Mark would love you to read ..How Your Cash Strapped Small Business Generates More Customers For Less Money!